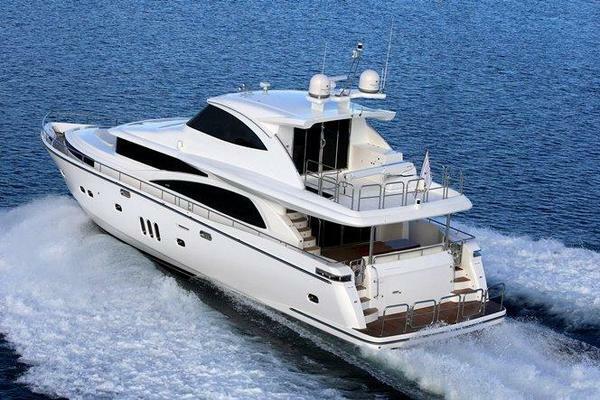 This77' President Enclosed Bridge Motor Yacht ADIOS was built by President Yachts, a builder specializing in custom yachts built to customer specifications. Powered with CAT C-32 engines with less than 600 hours this yacht has been lightly used and well cared for with the same captain since new. The engines are covered by a transferable extended warranty from Caterpillar. The interior is exquisite carpentry of high gloss cherry with an open galley and high gloss teak floors.Air conditioning service completed April 2018, with one new 4 ton chiller and the other chiller rebuilt. United Yacht Sales New Jersey would love to guide you through a personal showing of this 77' President Custom 750 Enclosed Bridge 2009. 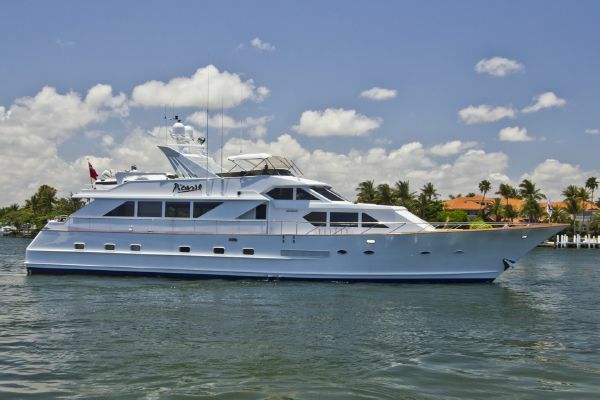 This yacht for sale is located in Fort Lauderdale, Florida and priced at $1,995,000. For a showing please contact us by filling out the form on this page and we will get back to you shortly! The galley is forward and open to the salon and to the dinette area. Since the yacht has an enclosed flybridge there is no need for a space robbing lower helm. The appliances were built in behind the same high gloss cherry wood paneling. The galley itself is "U" shaped with counters of black galaxy granite on three sides with matching flooring. Extra pantry space was built in for extended Bahamas cruising away from the supermarkets. All the way forward is the dining area. The U-shaped settee, with large table and two additional chairs provide seating for family and friends. Storage areas are under the settee with more storage in cabinets. On the starboard side, opposite the galley is a day head for convenience and the stairs to the enclosed skylounge. The head in the same high gloss cherry cabinetry has matching black marble flooring and counter top with a hammered metal sink. On both port and starboard side are offshore doors leading to the side decks. Flooring here is high gloss teak, the same as the main salon. Forward in the pilothouse are twin Stidd helm seats in black upholstery, looking out to the Portuguese bridge and walk around decks. This is a very unusual design to have a Portuguese bridge both on the main deck and on the bridge deck, plus walk around side decks around the skylounge. Adios has superb electronics and navigation equipment.Everything is labeled and well organized, including wiring and fuses underneath the helm panel. Under the helm is a large storage crawl space.The pilothouse provides a second salon area complete with a wet bar/entertainment area. The flooring, like the main deck is high gloss teak with cherry paneling. There is an additional Kitchen Aid icemaker and Sub Zero refrigerator. A large flat screen HDTV is above the marble countertop. There is an L-shaped leather settee with teak table that is on a raised platform for better visibility when underway. Doors aft, port and starboard lead to the upper deck. There is a 14' AB inflatable tender that can be lowered with the davit. All rails and fixtures have been upgraded to the highest quality of stainless steel. There is an electric grill located on the upper deck. A curving stairway leads down from the dinette area to the master and guest cabins. To the side of the stairs are two electrical panels with circuit breakers. One panel has 120 volt and 240 volt circuits and the other has 24 volt circuits. The two generators have start and stop controls here with generator engine gauges. Both generators are 30 kW so that they can be used interchangeably. This location for the panels is very convenient as someone can sit on the stairs to look easily at the breakers, plus the amperage and voltage meters, without bending down or kneeling.The stairs lead to a foyer with the master stateroom aft. The wood here is the same high gloss cherry with high gloss teak and holly flooring. The master stateroom has a center-line king walk around berth with night tables with lamps to each side, drawers and storage below. There is storage under the berth and to the starboard side of the cabin, closets are cedar lined. A large flat screen television in a frame of the same high gloss cherry is mounted on the bulkhead, the flooring here is also high gloss teak and holly.The ensuite master head has twin sinks in the marble counter top with matching marble flooring. The stall shower has a Groh multiple shower head fixture with one moveable shower head. The guest stateroom is forward with center-line queen berth. The ensuite head with stall shower has matching marble flooring and countertop. There is storage to both sides of the berth plus more underneath. There is a Sony flat screen television. Two overhead deck hatches let in natural light and fresh air. The third stateroom has twin singles berths for the most versatility for guests. The ensuite head with stall shower has matching marble floor and counter top. The crew stateroom is aft with access from the swim platform plus a hatch in the aft deck. The crew area is finished the same as the rest of the boat with granite counter tops and the same high gloss cherry paneling. There is a Bosh washer and dryer, in separate units, not a combination unit. There is a freezer and refrigerator built in under the counters. There is a sink, microwave and coffee maker here. The captain's cabin has a single berth with ensuite head and sink and separate stall shower. The boat was designed with full covered walk around side decks for ease of docking and boarding. The covered side decks also help keep some of the hot sun out of the salon windows. There are boarding gates on both sides with a Marquipt Sea Stair. Boarding can also be done from the oversize swim platform that was built two feet longer than the standard model. The boat has a Portuguese Bridge so that guests can walk to the bow of the boat but are protected behind the rail and there are two bench seats here for enjoying the view when cruising slowly. A very different design is to have another Portuguese Bridge in front of the skylounge with walk around decks here also. Forward of this is the bow area with a walkway of teak leading to the windlass. This makes a great nonskid material, much better than bare fiberglass. The Bow cleats were speechified to be oversize so that larger or multiple lines can be used. There is a three-sided mesh sunshade enclosure.The back deck is teak with molded in fiberglass steps to the bridge deck instead of a ladder that are also teak covered. The high gloss varnished oval table with inlaid wood in a star pattern has built in bench seating aft with three more teak chairs. There are two boarding gates to the swim platform on both port and starboard sides with molded fiberglass steps. The over-sized aft cleats can handle larger dock lines and there are warping winches to adjust dock lines. The caprails are varnished teak with stainless grab rails on top for extra safety.There is a cabinet for storage that also hold the aft deck docking station with engine controls, bow and stern thruster controls, engine start and stop switches and a rudder angle indicator. Dual 50 amp power cords are retracted with Glendenning Cablemasters. Access is through the crew quarters through a watertight door. The Caterpillar C- 32 engines are 1550 horsepower and have less than 600 hours as of Feb 8, 2018. The main engines are under extended warranty from Caterpillar that can be transferred to the new owner. There are two 30 kW Northern Lights Generators in Sound Shields rather one 30 kW and one smaller generator. Both generators have less than 600 hours on them as of February 2018.Air conditioning is a chilled water system with two chillers to provide redundancy along with two raw water pumps plus two circulating pumps for back up. Entrance to the salon is from a sliding glass and stainless steel sliding door. The first impression when coming into the salon is the wide open feeling of the boat with no bulkheads all the way to the forward windshield. The side windows are large and at a height that allows a good view of your surroundings when seated at the couch. The exquisite woodwork is high gloss cherry. To the port side is a custom couch with two occasional chairs to the starboard side and twin custom coffee tables of cherry and dark wood burl at the couch. There is another smaller matching table between the chairs and a third chair for extra guest and family seating. There are multiple storage areas and cabinets throughout the salon. A large flat screen television is hidden in the cabinetry and rises on an electric lift.